3 little flowers, for more friends. I think she placed them on napkins at a little lunch. The lavender smelled so good–doesn’t take much. Hope I can keep that growing! I hope you have it close to where you spend most of your time outdoors, I love the smell. My daughter-in-law just learned how much she loves it as it was growing just under her kitchen window in their new home. A simple clutch of flowers–just beautiful. I’m always impressed, too, by the creative settings in your photos. 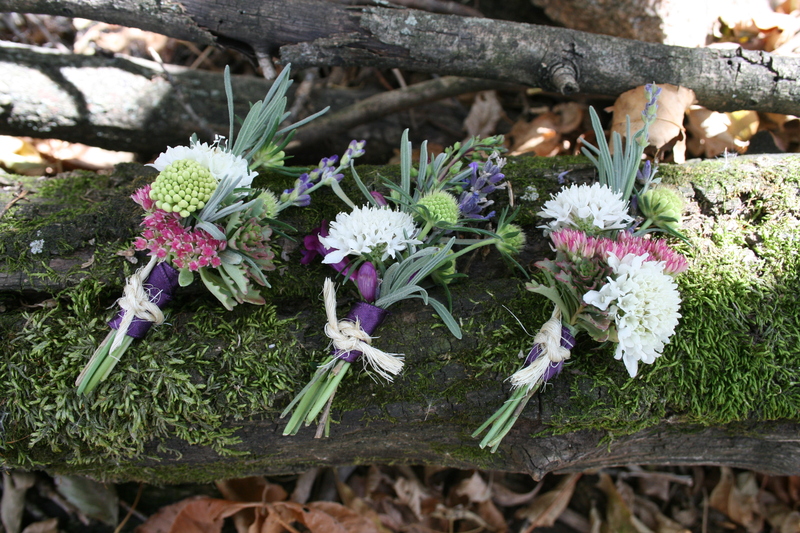 I believe she placed these on linen napkins at a little lunch table–made me think I should put together a Woodland table setting sometime–perhaps when you visit in the Spring! There is just a bit of color left out there! Very nice flowers. I iike your new header.